South Africa’s once-dominant mining sector is being threatened by regulatory uncertainty that is discouraging much-needed investment. South Africa’s formal mining sector, which is the oldest in Africa and goes back some 150 years, has the most developed legislative regime in the continent, with an array of laws that govern transformation, environmental and safety aspects, the issue of mining and prospecting licences, and taxes from operations. While the sector has also long been one of the economy’s most visible drivers, more recently regulatory uncertainty, labour strife, an increasingly widening gap and trust deficit between business and government, and calls for more intensive local beneficiation of the raw materials have resulted in a difficult operating environment for mining companies and substantially sub-optimal levels of investment in the sector. In a survey of mining companies across more than 100 countries worldwide in 2016, the Fraser Institute found that while some African jurisdictions were becoming more attractive to investors, South Africa’s policies – uncertainty and unpredictability in particular – were stifling the sector. Africa as a whole ranked above Asia, Latin America, and the Caribbean in terms of mining investment attractiveness. 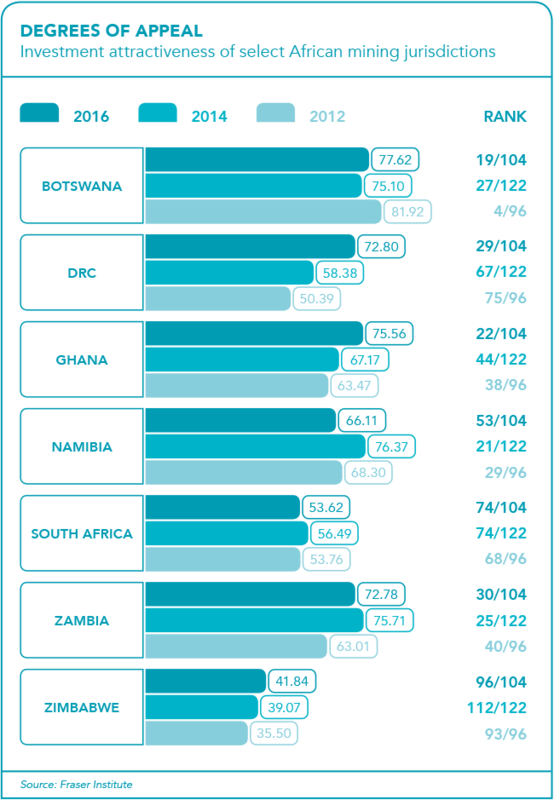 South Africa, however, scored poorly, at 47.5 points on the policy perception index, where it ranked above only South Sudan and Zimbabwe. On the investment attractiveness index, the country fell to 53.62 points from 58.04 the year before. The survey found that the new Mining Charter, which is yet to be finalised amid hostile spats in the courts between government and the Chamber of Mines, which represents mining houses, poses a threat to ownership of the mines. It refers to government’s ‘record of passing and then modifying laws to achieve policy objectives’. This, it argues, creates an ‘environment in South Africa that is not predictable’. According to Wandisile Mandlana, mining law partner at Bowmans, South Africa could improve its investor attractiveness in mining by adopting a more stable, predictable regulatory and policy regime, and bettering its mining governance institutional arrangements. ‘The impact of inconsistent mining policy and regulation has, for the past seven years, resulted in South Africa continuing on a downward trend on the Fraser Institute’s annual survey,’ he says. The survey rates more than 100 jurisdictions across the globe based on a combination of geological attractiveness for minerals and metals, as well as policy attractiveness in terms of encouraging or deterring investment and exploration. Mandlana argues that potential investors considering South Africa as an option are met with a high degree of policy unpredictability and uncertainty, among other factors. ‘For instance, when it comes to mine health, safety inspectors don’t always act consistently. This leads to mining houses not knowing what next to expect, and often having to resort to the courts to get operations back on track. ‘We also see this unpredictability play out in environmental legislation whereby government is now attempting to synchronise the different pieces of legislation pertaining to the environment and economic sectors into a single overarching law.’ He adds that this in itself is a good thing but it creates a huge degree of uncertainty in the process, as the existing environmental framework for the mining sector has been in operation for just two years, and it still has gaps. According to Mandlana, the countries that rank higher than South Africa in terms of both potential best mineral practices and investment attractiveness – including Botswana, Burkina Faso and Ghana – are perceived to have reasonable and predictable regulations, low political risk and strong, functioning and well-resourced mining governance institutions. ‘There are a number of things the South African government can do to improve its position,’ he says. The Africa Mining Vision is a policy position and roadmap adopted during a 2009 meeting of AU Heads of State to facilitate the transparent, equitable and optimal exploitation of mineral resources of Africa in a manner that would lead to broad-based sustainable growth and socio-economic development on the continent. Jonathan Veeran, partner and deputy head of mining and resources at Webber Wentzel, argues that while South Africa has a well-developed legislative framework, the inconsistent manner is which the incumbent government applies the mining laws often results in litigation between business and government. ‘Some laws, such as the current Mineral and Petroleum Resources Development Act [MPRDA] are poorly drafted in places and, to up the ante, proposed amendments to it have been pending since 2013,’ he says. Disaffection with the MPRDA is magnified by the fact that it is the key piece of legislation governing the acquisition of prospecting and mining rights, and the use and disposal of mineral rights. 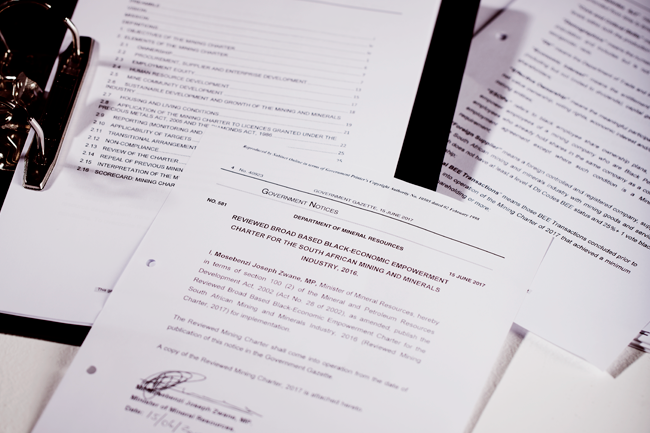 Expectations that long-awaited changes to the MPRDA would have been wrapped up by the end of 2017 were dealt a blow when the National Council of Provinces – one of the two houses of the South African Parliament – announced that the bill would stand over for finalisation in the following year. Veeran disagrees with industry players who maintain that the entire bill should be scrapped and redrafted after the most recent delay, saying this would only lead to even more policy uncertainty for investors, both local and foreign. He explains that the amendment bill proposes a system whereby applicants must request that the minister invite applications for rights, and under which the minister will be entitled to grant the right to the last applicant, affording only preference to the applicant who initiated the tender. ‘This might open the door to corruption,’ says Veeran. Of further concern is the bill’s proposed creation of an export licensing system whereby certain strategic minerals, such as coal, may only be exported with the written consent of the minister, subject to the prior supply of a specified portion of production to local beneficiators. The fact that the government is driving an increasingly beneficiation-focused agenda in the mining sector is problematic, given that South Africa currently lacks cheap energy, a conducive labour environment and an investor-friendly regulatory regime, according to Veeran. ‘South Africa needs a set of laws that addresses the needs of the mining sector in a holistic way, takes cognisance of the country’s economic realities, and promotes desperately needed mining investment,’ he says. South Africa has experienced a perpetual fall in the Fraser Institute’s policy perception index of mining jurisdiction since 2013. Meanwhile, top-performing African jurisdictions that improved their position include Botswana, Ghana and Côte d’Ivoire – ranking 12th, 31st and 40th respectively. The DRC recorded the biggest improvement in Africa based on mining houses’ perceptions of policy and pushed up its place by 17 points to take the 70th spot on the rankings. This is in stark contrast to South Africa, according to Veeran, where the country’s politicians use their legislative power to force an economic outcome and interfere with market forces. ‘We do understand fully what government needs to achieve in terms of socio-economic development and transformation in South Africa and we are more than ready to assist with those goals. 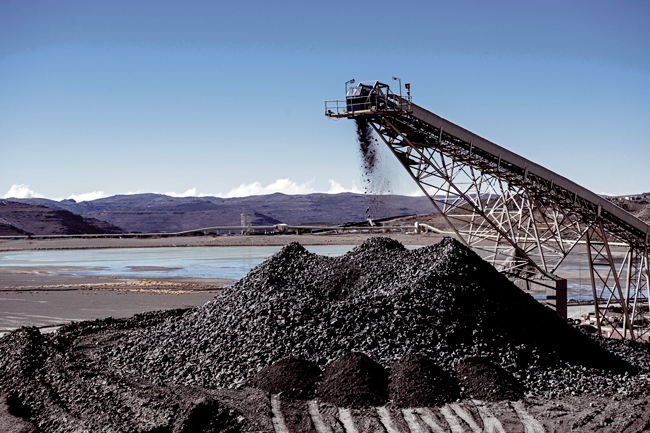 Compared to other African countries, says Veeran, South Africa is far ahead in terms of infrastructure such as roads, rail, harbours, logistics and financial markets – all key requirements for a flourishing mining sector to operate successfully. This is supported by Deloitte energy and resources lead (Africa), Andrew Lane. There is no perfect answer, he says. Ultimately, however, the South African government needs to balance the different needs of business on the one hand and the country and its people on the other. He adds that government needs to do much more to ensure policy consistency and predictability – all factors that would persuade investors and promote greater trust between government and miners.